Canoeing, kayaking, stand-up paddleboarding, wake boarding and foil boarding - All included. We live on the water. And we live for water sports on Judd Lake. We offer canoeing, inflatable kayaking, stand-up paddleboarding, wake boarding and foil boarding all included in our rate. 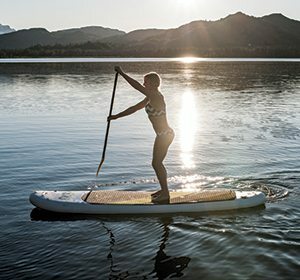 With the long daylight hours, water sports are a great summer highlight at Tordrillo Mountain Lodge. We provide equipment and instruction for all of our lake activities. Watersports safety is practiced at all times and we are happy to share our knowledge with you and your young ones. Additionally, if your activity of choice involves swimming, we provide wetsuits and dry suits. Judd Lake has great fishing as well as great wildlife viewing and birding. All of the lake-based activities and river activities are an ideal experience for families and first-timers alike. Come enjoy the water with us!